I found Memories Wait Alone to be a very interesting story. It starts out with Cecil Sherbowe as an elderly man bemusing the fact that the past is gone and he is left alone with his memories. Not all of them good. With good looks, money and fame he was definitely on top of the world. In 1885, in England, Cecil is a very young man, aged 17,told by his father that in order to inherit Sherbowe Estate, he needs to prove his worth by living as a villager in the village of The Deverills. He asks what happens if he doesn't go and is told that he will be disinherited. So thinking that this is a means of freedom, he goes. While there he meets a girl named Natalie, he is instantly attracted to this aloof girl and uses all of his skills that he thinks he has when wooing the girls. A misspoken word in anger leaves him devasted and searching for her all of his life. He does very well in his life in the village and even comes to like it. When his time is over he goes back to Sherbowe Estate to find that all is not as he left it. He spends his entire life searching for what he lost and when he finds it, fate conspires against him and he loses all again. 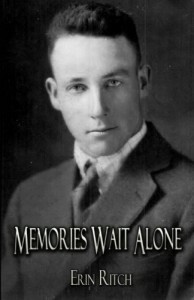 The book ends with Cecil an old man in 1957 with shadows in his soul and truly finding that memories do indeed wait alone. Written with a sadness that kept me turning the pages hoping that there would be a happy ending, but we all know that life does not always give us what we want or desire.